Surrounded by content resources, library spaces can be easily imagined as content creation spaces. School Libraries in particular, can be seen to have an almost ‘goldilocks’ environment, just right for a Makerspace. From outside, it may seem almost as easy as just making some space for crafting materials, robots and other digital technologies, and letting students tinkering away. However, the dimensions of space and resources in a School Library are just one small element of the programs and activities of a School Library, as defined in the International Federation of Library Associations and Institutions (IFLA) School Library Guidelines. In a recent podcast, Why we need qualified teacher librarians for the digital future, Holly Godfree, a Teacher Librarian with the Australian School Library Coalition described the influences of School Librarians on curriculum and teaching as often being “invisible”. It is this same ‘invisible energy’ of librarians who are the hidden faces of School Library Makerspaces. Alongside already diverse responsibilities as Teacher Librarians, Jackie and Megan are hands-on in the School Library Makerspace. They conceive, plan and support student learning. What is your role in the activities that happen in your school Makerspace? Jackie shared an example from her blog of an activity where students were encouraged to dismantle a laptop, using reference books to explore the components and terminology, including how the activity links to the Australian Digital Technologies Curriculum. Can you share a particular challenge(s) you faced establishing your STEM Makerspace in the School Library, and how you overcame it? Do you need to measure or assess the impact of the Makerspace activities that your students undertake? You both mention the value of your partnership as Teacher Librarians. 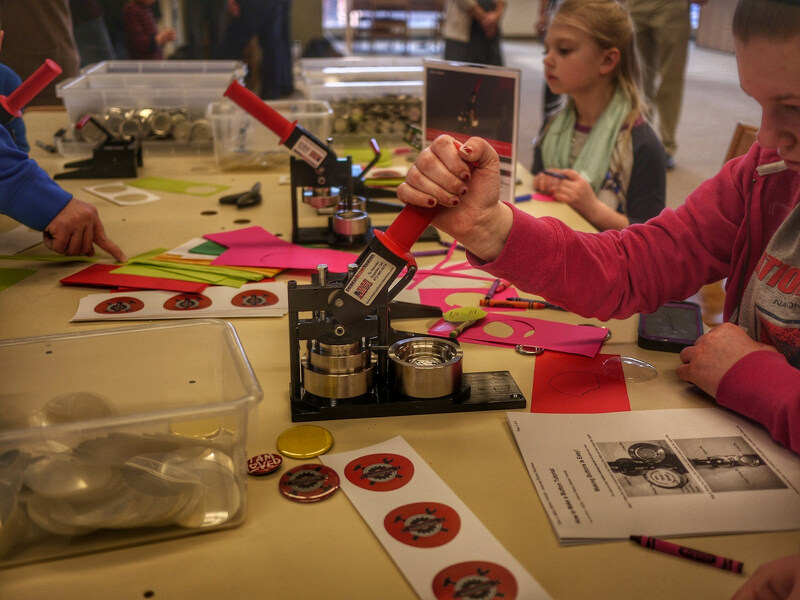 How has this teaching partnership contributed to the evolution of the Makerspace? “We complement each other in our own skill sets and passions. Megan is passionate about literature and the role it plays in a child’s life. Jackie is passionate about the possibilities technology has in education. Together we heard about and researched the maker movement. We saw it as a natural fit for our library, a place where information is disseminated, and technology is housed, therefore access to create, invent, design and learn was perfect. Where ever possible we use literature to inspire making and creating. The St Aidan’s Makerspace may be an inside space, but it doesn’t seem in any way bound or limited by its walls. As Teacher Librarians, Jackie and Megan are able to intentionally remove the physical boundaries of the School Library through the Makerspace, connecting the School Library to other teaching and learning approaches, including outdoor spaces. There are even links to the ‘inside, outside and beyond’ scope of nature-pedagogy and MIT’s Media Lab Projects, Passion, Peers and Play approach of “lifelong kindergarten”. School Libraries and Makerspaces for all? Nearly twenty years on from the manifesto, School Library advocacy is ongoing, and becoming increasingly urgent. An online campaign in the UK to ‘halt the decline of school libraries’, included the voices of popular authors and included people from all over the world sharing stories through the #ThankALibraryWorker hashtag. In Australia, as in other countries, the Australian School Library Association (ASLA) is launching the School Libraries Matter a campaign in March 2018 to include parents in the task of advocating for school libraries and Teacher Librarians. Supporting the school community to play and learn together in the School Library Makerspace, is one way that Jackie Child and Megan Daley as Teacher Librarians were able to invite the wider community to understand, care and value the St Aidan’s School Library. It began with a shared vision between two School librarians who created the connections to establish a new community within the library. A community that ultimately values making things together. Collaboration and co-creativity and transparency are unstoppable and unforgettable replacements for the old cultures of enforced compliance and acquiescence. I will sweep away existing institutions and methods. Maker spaces are not just resource centres. They empower and authorise in ways that will break old ways and force new accountability structures. It’s not just about agility, it’s about new ways of being accountable. These two women are pioneers. Sorry, typo. I meant “They will sweep away”….